Download this report to find out how budget restrictions and lack of senior management support for BDR continue to prevent organizations from being adequately prepared. Securing an organization’s information is challenging. An explosion in data growth has given rise to the development of increasingly complex systems and rapid changes in technology. Contributing to this complexity is the proliferation of mobile devices, the growth of social media, and the Internet of Things. 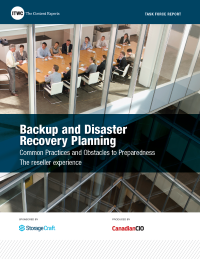 In this climate, end-user clients may be overwhelmed with options for data backup and disaster preparedness.